Search out a secret place to land." J.M. 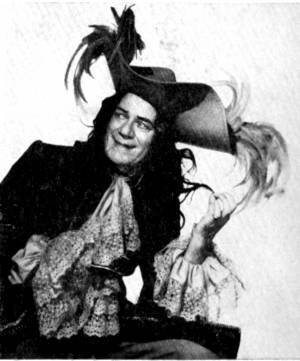 Barrie first introduced Peter Pan and the Lost Boys in his novel "The Little White Bird" in 1902. Since then, his ideas and imagery have sparked countless versions of Neverland and it's inhabitants. In fact, he produced several follow-ups himself: the play "Peter Pan; the Boy Who Wouldn't Grow Up" (1904) and "Peter and Wendy" his novel of the play (1911). 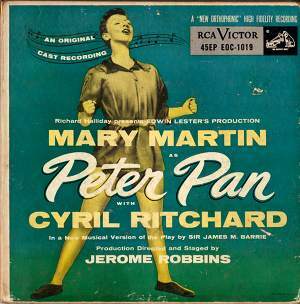 There was a silent movie in 1924; the 1954 Broadway musical with Mary Martin & Cyril Ritchard which was televised in the 1960s airing had been rebroadcast enough times to imprint Peter in the psyche of every US child growing up in front of the tv then. In 1976, another all-star cast presented a different tv musical with Danny Kaye as Captain Hook (& Mr. Darling) with Mia Farrow as Peter Pan. Though highly acclaimed this version quickly disappeared. We only saw it that once, but recall Capt. Hook saying, "Infamy! Infamy! Why does everybody have it in for me". Then there's the 1953 Disney animated cartoon, which Disney originally optioned in 1939. Disney installed Peter Pan's Flight in Disneyland in 1955. There have been many other notable adaptions which we've listed in the links section. Now that the copyrights to the Peter Pan story and characters have become public domain(*), prepare for the onslaught of spin-offs. Disney has the book series Peter and the Starcatchers. Macy's has their online marketing scheme "Wendy". The Syfy Channel has a 'prequel' "Neverland". * The Ormond Street Hospital continues to hold a unique right of royalty for all performances that takes place in the UK. Having trouble finding Neverland? If you live in the northeastern part of the U.S. you can hop on the Peter Pan Bus founded in 1933. Among other places they'll take you is to UMass Amherst, MA which is pretty close to Neverland for some of the students. I know it was for us. In music Peter Pan has been inspiring us for years. There are songs for the various theatrical, film and tv shows about Peter Pan. There was probably a score for the original silent film of 1924, though I've only seen Andrew Birkin's mention that his mother sang the overly sugary 'Peter Pan Song' at the beginning of every performance of the 1924 silent film at her father's theater. There are songs about how Peter Pan and other characters from the story become imagery and symbols for many of us. We saved each other's lives out on the pirate's deck." One's an act of sinister intent / The other was all a huge mistake"
Peter Pan Records was a record label of children's music from the 1940s and on, though other than the name and logo I'm not sure if there was any other connection other than they wanted to sell us this cool music in the hopes we never grew up. FWIW,they currently own the peter pan.com domain name. Andrew Birkin's site is the best place to start. He wrote "J M Barrie & the Lost Boys"
And the Indians (ed.) above Keep watch against foes." The Neverland of Id: Barrie, Peter Pan, and Freud by Michael Egan (1982) "...in his story Barrie unconsciously created a vast, symbolic metaphor - the Neverland - of the child's id; and that, secondly, he populated it with figures of an almost archetypal resonance." The case of Peter Pan, or, The Impossibility of Children's Fiction by Jacqueline Rose (1984) - a book about what our interests in the phenomenon of Peter Pan tells us about ourselves. - not surprisingly, the majority of images online are from the Disney animation - however here are a few other resources. Peter Pan illustrations by Mabel Lucy Atwell for the 1921 Hodder & Stoughton Limited Edition. - you can probably find all of these illustrations by googling, now that you know who to look for. Walt Disney's Peter Pan & Alice In Wonderland Record - Wonderful cover art by Pete Hawley which is not from the movie. New Film Score (2010) Leslie McMichael wrote & performed a new film score. 1950 Peter Pan Broadway musical. Music and lyrics by Leonard Bernstein. Jean Arthur played Peter Pan and Boris Karloff was Captain Hook. I did not find any mention of original recordings, but in 2005 Alexander Fray recorded the Bernstein: Peter Pan CD. Flying by Foy Peter Foy developed a number of theatrical flying innovations and directed the flying sequences for the Mary Martin Peter Pan. Never Never Land (1980) 1980 British drama starring Petula Clark, Cathleen Nesbitt & Anne Seymour. - a parallel tale to the Peter Pan. When 7 year old Zena runs away she finds an abandoned townhouse occupied by young ruffians & Wendy plays "mother" to the Lost Boys. It did poorly & was never released in the US. Petula Clark sang the film's theme song "Fly Away". Hook directed by Steven Spielberg (1991) with Robin Williams as a grown up Peter & Dustin Hoffman as Capt. Hook. While this film has lots of fun moments, it tries to answer several questions that should never have been asked. Return to Never Land (February 2002), an animated sequel to the 1953 Disney film, in which Wendy's daughter Jane becomes involved with Peter Pan, set during World War II. Peter Pan (2003) Delightful retelling of this story with up to date special effects. "Wendy" - produced and available only on Macy's. 6 mini-episodes released October 2011. Macy's made this pretty difficult to find on their website and then once there, it just didn't hold up. And by the time you read this, it may have vanished from their site too. More related Peter Pan films - just couldn't link them all here. As I mentioned TagYerit's song "Wendy Bird" is about our concerns for the environment and various ecological issues including pollution, global warming, loss of habitat etc. so here are links to a few organizations that have been working hard to protect this amazing natural world that we've inherited. Randy as Peter Pan It's possible that nobody today is trying their hardest to live the Peter Pan dream as is Randy Constan. You will find several Peter Pan inspired songs here. James McMurtry "Peter Pan James McMurtry tells his tale of Never Never Land. 2010. 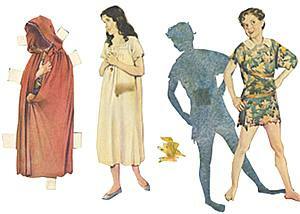 The Peter Pan Syndrome - a term used to define childish behavior in adulthood. (Earliest cited use 1966). The term "puer aeternus" is a 2000 year old term for "eternal boy". 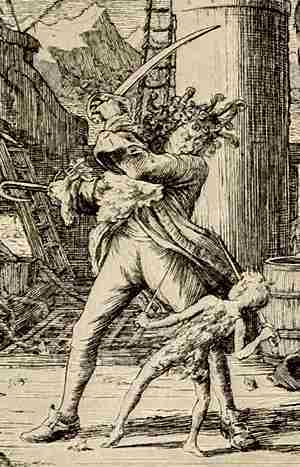 Carl Jung defined this as an example of an archetype. I'd be remiss if I didn't at least mention Michael Jackson who did his best to stay young and lived at his Neverland Ranch. "Never Never Land" is a print on foil by Jean & Ron Henry 1992 - showing Mermaid Lagoon and all the major characters.